Workshops, presentations, webinars, webcasts, keynote addresses, and other mental health and parenting events featuring Ann Douglas, author of Parenting Through the Storm. Interested in attending an upcoming event? Here's what Ann has in the works. Looking for descriptions of Ann's most popular presentation topics? You'll find them here. Ann Douglas spoke about Happy Parents, Happy Kids at this event for parents. Ann Douglas spoke about Social Media Smarts at this event for parents. Ann Douglas spoke about Parenting Through the Storm at this event for parents, teachers, and other community members. Ann Douglas delivered a workshop for teachers (The Umbrella Workshop: Supporting Families Through the Storm) and for parents (Parenting in an Age of Anxiety: A Stress and Anxiety Toolkit for Parents) during her visit to this school. Ann Douglas delivered a keynote address about family engagement, family empowerment, and family support (Parenting Through the Storm: A Guide to Supporting Families) at this workshop for neonatal nurses and parents. 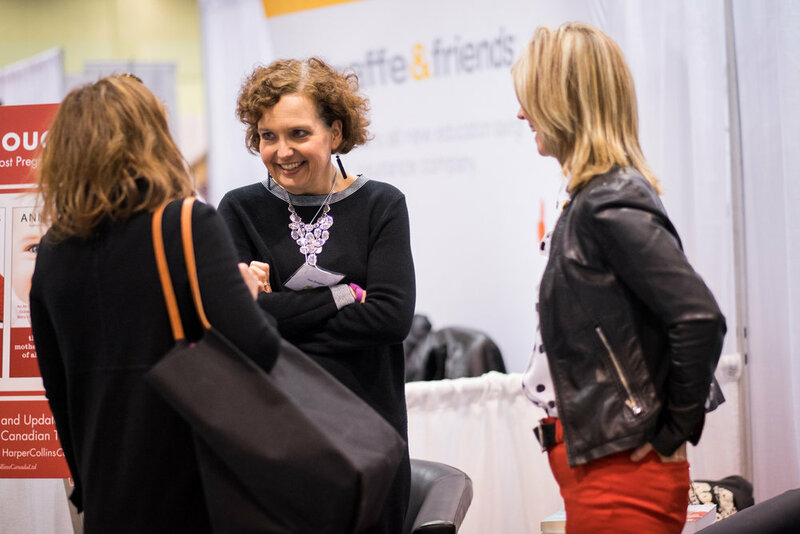 Ann Douglas shared 12 strategies for being a happier parent at this popular consumer show for parents and parents-to-be. Ann Douglas delivered the opening keynote (Happy Parents, Happy Kids) at this conference for representatives of home and school associations in Ontario. Ann Douglas spoke about Parenting in an Age of Anxiety: A Stress and Anxiety Toolkit for Parents at this event at Lorne Park Public School. Ann Douglas was part of the “Family Resilience” panel at the second Families in Canada Conference hosted by the Vanier Institute of the Family. Ann Douglas met with parents and encouraged them to write words of encouragement to other parents. You can read some of their kind and encouraging messages in this short video. Ann Douglas presented two workshops — The Umbrella Workshop: Helping Families to Weather the Storm and Let’s Start a Self-Care Revolution — at this conference for early childhood educators. Ann Douglas spoke on “Happy Parents Raising Happy Kids: A Call to Action for Communities” — a community conversation hosted by psychologist and author Dr. Vanessa Lapointe. Ann Douglas delivered the opening keynote (Happy Parents, Happy Kids) and two workshops on Parenting Through the Storm at this highly popular annual conference for parents. Ann Douglas delivered The Umbrella Workshop: Supporting Families Through the Storm for this audience of early childhood educators and early years health promotion professionals. Ann Douglas co-hosted this chat about the need for greater investment in child and youth mental health. Ann Douglas spoke about Parenting in an Age of Anxiety at this parenting event. Ann Douglas highlighted some important facts about adolescent development and shared parenting strategies that work for parents and teens in a presentation entitled The Truth About Teens. Ann Douglas moderated the parent panel at this conference for parents, youth, clinicians, researchers, and others engaged in the child and youth mental health sector in Ontario. Ann Douglas delivered a keynote address about family engagement (Supporting Families Through the Storm) and led an afternoon workshop about mindful parenting, self compassion and self care (It’s All About You!) at this conference for clinicians, administrators, and parents. Ann Douglas delivered The Mother of All Toddler Workshops at this conference for Thornhill-area parents of young children. The workshop is based on the content in newly updated Canadian edition of The Mother of All Toddler Books. Ann Douglas hosted this intimate, small group workshop for parents of toddlers in partnership with the Peterborough childbirth education and doula practice Hello, Baby! Ann Douglas spoke about Parenting Through the Storm at this school event. Ann Douglas hosted an interactive quiz show (Toddler Trivia) for parents of toddlers at this large consumer trade show for parents of young children. Ann Douglas delivered the keynote address (The Umbrella Workshop: Helping Families to Weather the Storm) at this training event for victim services volunteers and other professionals (police officers, early childhood educators, and social service workers) supporting parents and children in the community. Ann Douglas spoke about Parenting in an Age of Anxiety at this community event. Ann Douglas spoke about Big-Picture Parenting at this community event co-hosted by Central Public School and Victory Public School. Ann Douglas spoke about the role of “the village” in supporting parents. If it takes a village to raise a child, it takes a village to support that child’s parent. Ann Douglas co-hosted this popular online chat for parents and teachers. The focus of this back-to-school chat was building strong and healthy parent-teacher relationships. Ann Douglas spoke about Parenting Through the Storm at this community mental health event. Ann Douglas spoke about Parenting Through the Storm at this Parents Reaching Out event. Ann Douglas spoke about managing screen time as a family (and shared strategies for parents and kids). Ann Douglas spoke about Parenting in an Age of Anxiety: A Stress and Anxiety Toolkit for Parents at this Parents Reaching Out event. Ann Douglas spoke about The Truth About Teens at this Parents Reaching Out event. Ann Douglas spoke about Healthy Parents, Healthy Kids at this Parents Reaching Out event. Ann Douglas spoke about Parenting Through the Storm at this community and school event. Ann Douglas spoke about Big-Picture Parenting at this community and school event. Ann Douglas spoke about Big-Picture Parenting at this Parents Reaching Out event. Ann launched a brand new Canadian edition of The Mother of All Toddler Books and hosted Toddler Trivia. Ann Douglas spoke about Parenting in an Age of Anxiety: A Stress and Anxiety Toolkit for Parents" at this Parents Reaching Out event. Ann Douglas delivered the keynote address ("The Power of Connection") at this conference for tutors working with child, youth, and adult learners. Ann Douglas delivered a workshop called "Let's Spark a Revolution of Caring" (on self-compassion and self-care). Ann Douglas acted as a responder for the "Making Research Understandable: New Channels of Communication" workshop. Panelists included Christine Chambers, Louise Kinross, and Rachel Maartens. Moderated by Kate Robson. Ann Douglas spoke on "Your Top Ten Pregnancy and Birth-Related Worries" at this popular parenting show. Ann Douglas delivered the keynote address ("Supporting Families Through the Storm") and a self-care workshop ("Let's Start a Self-Care Revolution") at this conference for early childhood educators and other professionals working with young children and their families. Ann Douglas delivered a keynote presentation on "Supporting Families Through the Storm" (what principals and vice-principals need to know about supporting children and families who are struggling). Ann Douglas spoke about the transition to parenthood in a webinar entitled "This is Your Soon-to-be Life: A Sneak Peek at Life After Baby." Ann Douglas was the keynote speaker at this parenting conference in Waterloo Region. She spoke about Parenting Through the Storm: strategies that allow parents and children to thrive while living with a mental health, neurodevelopmental, or behavioural challenge. She also participated in a panel on self-care strategies for parents. Ann Douglas co-hosted this Twitter chat on child and youth mental health and back-to-school parenting (part of the #kidscantwait series of Twitter chats). Ann Douglas co-hosted this highly popular chat, which focuses on learning and attentional issues. The chat focused on "Building Parent Teacher Relationships." Ann Douglas joined Kathy Buckworth, Alyson Schafer, Jennifer Reynolds, Julie Cole, Maureen Dennis, and Heather Greenwood Davis for a chat about all things summer parenting. Ann Douglas co-hosted this highly popular chat, which focuses on learning and attentional issues. The chat focused on "Avoiding the Summer Slide" (strategies for minimizing summer learning loss). Big-PIcture Parenting presentation for parents. Parenting in an Age of Anxiety: A Stress and Anxiety Toolkit for Parents. Employee lunch and learn on parenting and mental health. Private workplace event. May the Fourth be with you: Parenting through the Storm with CBC Radio Parenting Columnist Ann Douglas. Presentation for parents and community members. Parenting Through the Storm presentation for parents and community members. Big-Picture Parenting and Parenting Through the Storm presentations for a group of parents and community support workers on Manitoulin Island, Ontario. Journeying Together: The Why and How of Family Engagement. A presentation for speech and language pathologists in the City of Toronto. Big-Picture Parenting presentation for parents. This graphic recording by Tanya Gerber captures some of the key ideas and concepts. Parenting Through the Storm workshop for parents. Ann Douglas was a guest speaker on #AXSChat -- an open online community of individuals dedicated to creating an inclusive world and who believe that accessibility is for everyone. Ann Douglas co-hosted this highly popular chat, which focuses on learning and attentional issues. The chat focused on "Creating a Support System" (identifying friends and allies who care for your child and who would be willing to offer practical and/or emotional support to your child and your family). Ann Douglas spoke about Big-Picture Parenting: parenting with your hopes and dreams for your child in mind. Ann Douglas spoke about parenting strategies that promote children's mental health and offering advice on how parents, teachers, and other community members can offer support to a child is struggling. Ann Douglas co-hosted a Twitter chat on bullying prevention and mental health. Ann Douglas was the guest of honour at this special wrap-up event for the school's Parenting Through the Storm Book Club. Ann Douglas was the keynote speaker at this kick-off event for TD Bank Group employees. Her topic was Parenting Through the Storm. Ann Douglas presented the closing keynote address (The Power of Stories) at this literacy conference for Trent University students and community members. Ann Douglas co-hosted a Twitter chat on children's mental health with Kim Moran, CEO of Children's Mental Health Ontario. The Big Picture: A Mindful Approach to Parenting presentation followed by a Q&A with parents. A lively and informative Twitter chat hosted by Understood.org, a national organization that seeks to support parents who have children with learning differences. The Big Picture: A Mindful Approach to Parenting keynote address for parents and educators. Operation Rejuvenation workshop for adoptive and foster parents raising children with special needs. The Power of Stories workshop for parents. Why self-care matters and how educators can become ambassadors when it comes to creating a culture of self-care in families, schools, and communities. Co-hosted with Jim Grieve, Executive Director, Retired Teachers of Ontario. The Courage to Change presentation on self-compassion, self-care, and living the happiest, healthiest life possible. Keynote speaker for mental health fundraising event in support of community mental health services. Sponsored by Bell Let's Talk. Parenting Through the Storm presentation for parents. The Truth About Parenthood presentation for parents. Ann Douglas delivers workshops and keynote addresses that focus on mindful parenting. These notes were created by graphic recording artist Tanya Gerber at a May 2016 parenting event. 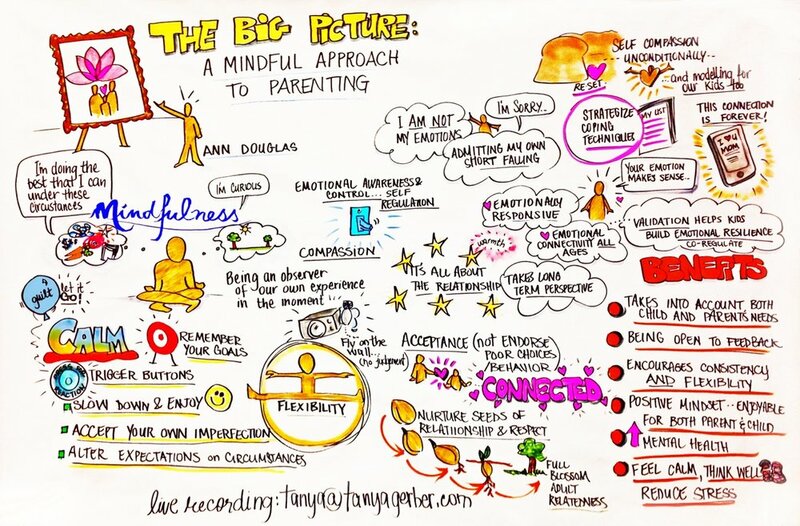 The Big Picture: A Mindful Approach to Parenting presentation for parents. Private event for Bell Canada employees as part of the lead-up to Bell Let's Talk Day 2016. Interview with Ann Douglas on motherhood and mental health advocacy. Moms for Mental Health fundraising breakfast in support of the Youth Services Bureau of Ottawa. Parenting Through the Storm workshop for parents of multiples. Webinar focusing on anti-bullying strategies for parents, teachers, and others who work with or care about children. Parent panelist for workshop on family engagement in mental health services. The Big Picture: A Mindful Approach to Parenting keynote address. Parenting Through the Storm workshop for parents. Live event that was also webcast across the province. Workshop for family support workers and early childhood educators on engaging with families who have one or more children who are struggling. Keynote speaker and workshop leader for this day-long symposium of learning for parents. Keynote speaker at Family Association for Mental Health Everywhere (FAME) Annual General Meeting and Awards Gala. During the event, Ann was inducted into the organization's mental health advocacy Hall of Fame. Parenting Through the Storm webinar hosted by this national mental health non-profit organization. Online conversation about supporting a child with a mental health, neurodevelopmental, or behavioural challenge. Keynote speaker at Child Development Resource Connection Peel (CDRCP) annual general meeting. Parenting Exceptional Children with Ann Douglas and Kristine Barnett. Parents and Educators Working Together #leadershipshine Twitter chat. Parenting Through the Storm webinar for parents hosted by this mental health non-profit organization. Parenting Through the Storm webinar for parents hosted by EAP provider Morneau Shepell. Keynote speaker for the Demystifying Youth Mental Health Mini-Conference. Speaker for this community mental health fundraising event. Moderator of a panel on risk and resilience in youth at the Toronto Spur Festival, "a national festival of politics, art, and ideas" designed to spark important conversations between Canadians. Bartimaeus Family Service, Toronto, Wed, Apr 8, 2015, 7:00 pm to 9:00 pm. Coping strategies for parents who have a child (or and for professionals who are supporting families with children) who are struggling with a mental, neurodevelopmental, or behavioral challenge. Workshop for parents and child-youth professionals. Happy, Healthy Parents, Happy, Healthy Kids workshop for parents. Ann Douglas chats with a parent at The Baby Show, Toronto. Big-Picture Parenting workshop for parents. Keynote speaker for child and youth mental and wellness event. Coping strategies for parents who have a child who is struggling with a mental, neurodevelopmental, or behavioural challenge. Supporting a parent who has a child who is struggling with a mental health, neurodevelopmental, or behavioural challenge. A professional development workshop for EAP providers.